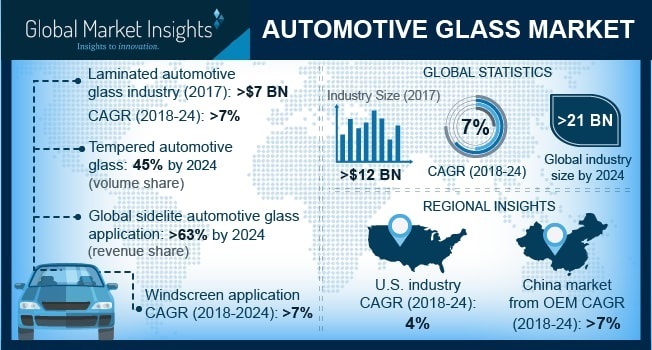 Automotive Glass Market size is estimated to surpass USD 21 billion by 2024; according to a new research report by Global Market Insights, Inc. Rising automotive production across the globe in conjunction with area of vehicle covered with glass will drive the industry growth. Increasing automotive glass consumption per vehicle due to the change in car models has enhanced the business growth. Inclination towards large windscreen along with growing demand for sunroofs will drive the automotive glass market size. Emerging technological advancements including smart glass that ensures enhanced visibility, protection from sunlight and improved comfort will support the product penetration. Increasing product usage with an aim to reduce weight and improve fuel efficiency has positively influenced industry growth. Transportation industry expansion coupled with increasing production capacity will fuel the product demand. Laminated automotive glass market is estimated to generate revenue over USD 11 billion by 2024. Prevention from penetration, easy reparability, sound proofing and clear visibility are the substantial properties encouraging the product consumption. Tempered product is set to witness over 6% growth up to 2024. High strength and toughness due to controlled chemical and thermal treatment are key factor driving product demand. Backlite will observe gains around 5% in the coming years. Safe shattering, high impact resistance and superior defrosting properties are the driving factors for industry growth. Sidelite will witness strong growth owing to increasing technological advancement including solar control glass. Original Equipment Manufacturers (OEM) accounted for more than 80% of the overall industry share in 2017. Rising safety norms along with expansion in automotive industry are the factors surging industry growth. ARG market will witness around 5% growth from 2018 to 2024. Increasing road accident rates along with vehicle damage due to critical weather conditions will propel the ARG market growth. Aftermarket products may differ in certain specifications, owing to the patent and copyright infringement laws. Passenger vehicles automotive glass market will generate over USD 14 billion by 2024. Upsurge in demand for passenger cars particularly in the emerging countries owing to increased disposable income has stimulated industry growth. Attain fuel efficiency and reduce carbon emissions will trigger the product demand in this segment. Automotive glass market from light commercial vehicles will observe growth around 5% by 2024. Rapid urbanization, high transport rates and rising demand for mini-trucks and vans are the considerable factors of the product development. Increasing accident rates due to heavy traffic in urban areas has positively influenced the product demand. The U.S. automotive glass market from laminated product was worth more than USD 700 million in 2017. Stringent regulations for passenger safety in conjunction with consumer awareness pertaining superior quality glass capable of handling impact and bad weather will drive the regional demand. Shifting trends for supercars and modified cars with increased utilization of tinted products particularly in the U.S. is supporting product innovations. Large presence of the leading automobile manufacturers in Germany and Italy will favor the overall Europe automotive glass market growth. China automotive glass market from OEM is estimated to witness over 7% growth up to 2024. High consumer spending on vehicles accompanied by inclination towards luxury and supercars are the factors driving industry demand. Large presence of manufacturing facilities coupled with rapid industrialization mainly in China and India will propel the product growth. Global automotive glass market share is consolidated in nature with the presence of key players including Saint Gobain Sekurit, AGC, Nippon, Xinyi, Guardian and Fuyao accounting for major industry share in 2017. Other notable players include Magna International, Inc., Shenzhen Benson, PGW, Gentex Corporation and Webasto.